Was Minoru Yamasaki the unluckiest Modern architect of the last century? 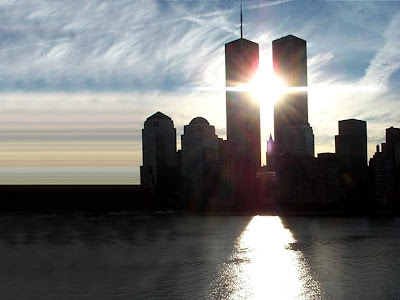 On the 11th of September 2001, his World Trade Centre was destroyed by terrorist hijackers. 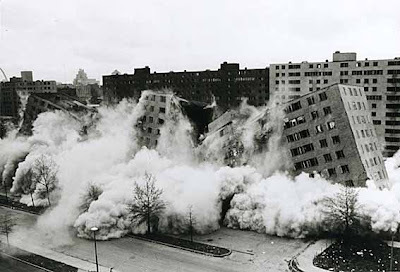 But more than thirty years before, the infamous public housing at Pruitt Igoe he designed with George Hellmuth in 1951 was demolished by the City that built it. The Puitt Igoe project was supposed to be the epitome of modernist architecture - "designed for interaction" and a solution to the problems of urban development and renewal in the middle of the 20th Century. The scheme was in the De Soto-Carr neighbourhood, an extremely poor section of St. Louis. The City commissioned it as part of the post-WWII federal housing program, in an attempt to bring people back to the city. Post-modern critic Charles Jencks said it was “the day modernism died”. Sorry but I find it a bit offensive that you decided to use the world trade centers as your 'demolished picture' Why not use a Vegas casino demolition pic? I am sorry that there are people who were offended by the picture. My point is that the architect for both the World Trade Center and Pruitt Igoe aws Minoru Yamasaki. Anyway, I'm replacing the picture that I used. I agree, of the two designs, the twin towers had a structural flaw causing it to collapse after the terrorist attack and the other was perfect in concept but flawed in reality and so was destroyed. How does this guy get work?